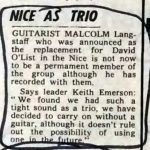 Undoubtedly the breifest tenure in the band, Malcolm Langstaff was a guitarist frm the North-east (presumably known to Lee) who replaced Davy O’List for a few weeks. 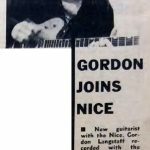 he was cited in the press (called “Gordon”) as having joined, then shortly afterwards having “left” and I can find no further reference to him. Has anyone got further information? He is credited on Wikipedia as appearing on “1st Movement: Awakenings” from Ars Vita Longa Brevis but I’m damned if I can hear any guitar on that track. 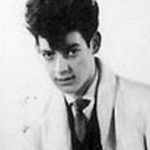 There is some guitar on “2nd Movement – Realisation” It also sounds like a “jangly” guitar and the photo show’s him playing what I think is a Gretsch, which would sound somthing like it does on the track. However, Davy did play this track live with them. Earlier in his career, Langstaff was a member of The Kylastrons. He died in 2007.